Ratnakara was an inhabitant of Vaishli. His house is referred by Hiuen-tsang in north 3-4 li from the great Markat-hrad. When he listen that Lord Buddha is dwelling in Amrapali’s grove he with his 500 hundred followers came forth from the city of Vaisali and presented himself at the grove of Amrapali. “Each 500 young approached the Buddha, bowed at his feet, circumambulated him clockwise seven times, laid down his precious parasol in offering, and withdrew to one side. As soon as all these precious parasols had been laid down, suddenly, by the miraculous power of the Lord, they were transformed into a single precious canopy so great that it formed a covering for this entire billion-world galaxy. The surface of the entire billion-world galaxy was reflected in the interior of the great precious canopy, where the total content of this galaxy could be seen: limitless mansions of suns, moons, and stellar bodies; the realms of the devas, nagas, yaksas, gandharvas, asuras, garudas, kimnaras, and mahoragas, as well as the realms of the four Maharajas; the king of mountains, Mound Sumeru; Mount Himadri, Mount Mucilinda, Mount Mahamucilinda, Mount Gandhamadana, Mount Ratnaparvata, Mount Kalaparvata, Mount Cakravada, Mount Mahacakravada; all the great oceans, rivers, bays torrents, streams, brooks, and springs; finally, all the villages, suburbs, cities, capitals, provinces, and wildernesses. All this could be clearly seen by everyone. And the voices of all the Buddhas of the ten directions could be heard proclaiming their teachings of the Dharma in all the worlds, the sounds reverberating in the space beneath the great precious canopy. At this vision of the magnificent miracle effected by the supernatural power of the Lord Buddha, the entire host was ecstatic, enraptured, astonished, delighted, satisfied, and filled with awe and pleasure. They all bowed down to the Tathagata, withdrew to one side with palms pressed together, and gazed upon him with fixed attention. The young Licchavi Ratnakara knelt with his right knee on the ground, raised his hands, palms pressed together in salute of the Buddha, and praised him. "Lord, these five hundred young Licchavis are truly on their way to unexcelled, perfect enlightenment, and they have asked what is the bodhisattvas' purification of the buddha-field. Please, Lord, explain to them the bodhisattvas' purification of the buddha-field!" "Good, good, young man! Your question to the Tathagata about the purification of the buddha-field is indeed good. Therefore, young man, listen well and remember! I will explain to you the purification of the buddha-field of the bodhisattvas." "Very good, Lord," replied Ratnakara and the five hundred young Licchavis, and they set themselves to listen. "Noble sons, a buddha-field of bodhisattvas is a field of living beings. Why so? A bodhisattva embraces a buddha-field to the same extent that he causes the development of living beings. 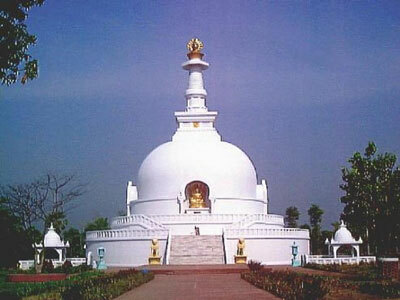 He embraces a buddha-field to the same extent that living beings become disciplined. He embraces a buddha-field to the same extent that, through entrance into a buddha-field, living beings are introduced to the buddha-gnosis. He embraces a buddha-field to the same extent that, through entrance into that buddha-field, living beings increase their holy spiritual faculties. Why so? Noble son, a buddha-field of bodhisattvas springs from the aims of living beings. "Yet, Ratnakara, a bodhisattva's buddha-field is a field of positive thought. When he attains enlightenment, living beings free of hypocrisy and deceit will be born in his buddha-field. "Noble son, a bodhisattva's buddha-field is a field of high resolve. When he attains enlightenment, living beings who have harvested the two stores and have planted the roots of virtue will be born in his buddha-field. "A bodhisattva's buddha-field is a field of virtuous application. When he attains enlightenment living beings who live by all virtuous principles will be born in his buddhafield. "A bodhisattva's buddha-field is the magnificence of the conception of the spirit of enlightenment. When he attains enlightenment, living beings who are actually participating in the Mahayana will be born in his buddha-field. "A bodhisattva's buddha-field is a field of generosity. When he attains enlightenment, living beings who give away all their possessions will be born in his buddha-field. "A bodhisattva's buddha-field is a field of tolerance. When he attains enlightenment, living beings with the transcendences of tolerance, discipline, and the superior trance - hence beautiful with the thirty-two auspicious signs - will be born in his buddha-field. "A bodhisattva's buddha-field is a field of meditation. When he attains enlightenment, living beings who are evenly balanced through mindfulness and awareness will be born in his buddha-field. "A bodhisattva's buddha-field is a field of wisdom. When he attains enlightenment, living beings who are destined for the ultimate will be born in his buddhafield. "A bodhisattva's buddha-field consists of the four immeasurables. When he attains enlightenment, living beings who live by love, compassion, joy, and impartiality will be born in his buddha-field. "A bodhisattva's buddha-field consists of the four means of unification. When he attains enlightenment, living beings who are held together by all the liberations will be born in his buddha-field. "A bodhisattva's buddha-field is skill in liberative technique. When he attains enlightenment, living beings skilled in all liberative techniques and activities will be born in his buddha-field. "A bodhisattva's buddha-field consists of the thirty-seven aids to enlightenment. Living beings who devote their efforts to the four foci of mindfulness, the four right efforts, the four bases of magical power, the five spiritual faculties, the five strengths, the seven factors of enlightenment, and the eight branches of the holy path will be born in his buddha-field. "A bodhisattva's buddha-field is his mind of total dedication. When he attains enlightenment, the ornaments of all virtues will appear in his buddha-field. "A bodhisattva's buddha-field is the doctrine that eradicates the eight adversities. When he attains enlightenment, the three bad migrations will cease, and there will be no such thing as the eight adversities in his buddha-field. "A bodhisattva's buddha-field consists of his personal observance of the basic precepts and his restraint in blaming others for their transgressions. When he attains enlightenment, even the word 'crime' will never be mentioned in his buddha-field. "A bodhisattva's buddha-field is the purity of the path of the ten virtues. When he attains enlightenment, living beings who are secure in long life, great in wealth, chaste in conduct, enhanced by true speech, soft-spoken, free of divisive intrigues and adroit in reconciling factions, enlightening in their conversations, free of envy, free of malice, and endowed with perfect views will be born in his buddha-field. "His virtuous application is tantamount to his high resolve, his high resolve is tantamount to his determination, his determination is tantamount to his practice, his practice is tantamount to his total dedication, his total dedication is tantamount to his liberative technique, his liberative technique is tantamount to his development of living beings, and his development of living beings is tantamount to the purity of his buddhafield. "The purity of his buddha-field reflects the purity of living beings; the purity of the living beings reflects the purity of his gnosis; the purity of his gnosis reflects the purity of his doctrine; the purity of his doctrine reflects the purity of his transcendental practice; and the purity of his transcendental practice reflects the purity of his own mind.